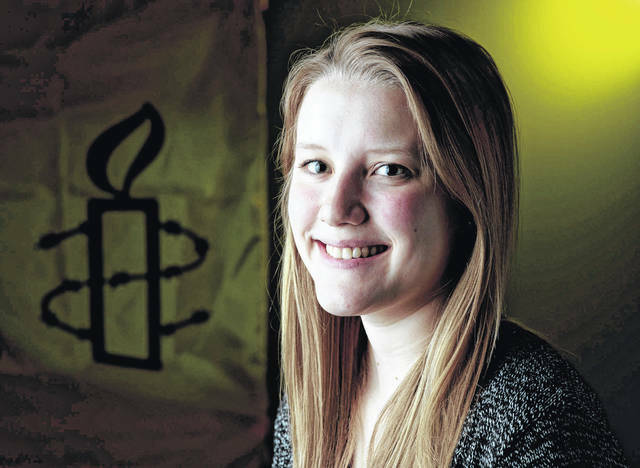 Ohio Northern University senior Hannah Ray works on campus with Amnesty International. Ray is a political science and statistics major with a minor in international relations. ADA — Ohio Northern University student Hannah Ray has been selected as a Newman Civic Fellow. She is among 250 students nationwide to earn the one-year fellowship, which is sponsored by Campus Compact, a group working to advance the public purposes of higher education. Ray is a junior political science and statistics double major from Cumberland, Ohio, who attended Shenandoah High School. https://www.limaohio.com/wp-content/uploads/sites/54/2019/04/web1_HANNAH-RAY-orig.jpgOhio Northern University senior Hannah Ray works on campus with Amnesty International. Ray is a political science and statistics major with a minor in international relations.